Wondering how to choose kitchen appliances for a remodel? Discover a few considerations for choosing kitchen appliances for your kitchen renovation. Rule number 1 in kitchen renovations: they always take longer than you expect. And after four full kitchen remodels in about ten years, I’m thrilled to say that this is the first time we have not also been living in the house during the renovation… so I’m feeling much less distressed about the timeline. In the past, something about washing dishes for a family of six in the bathtub and eating nothing but microwavable food really put the pressure on. 😉 But the main point here is that this current kitchen project is taking a bit longer than we expected. Fortunately, that has given me time to think, dream, and plan for our kitchen appliances in ways that previous projects never allowed. Another first for this kitchen is getting to choose all new appliances. 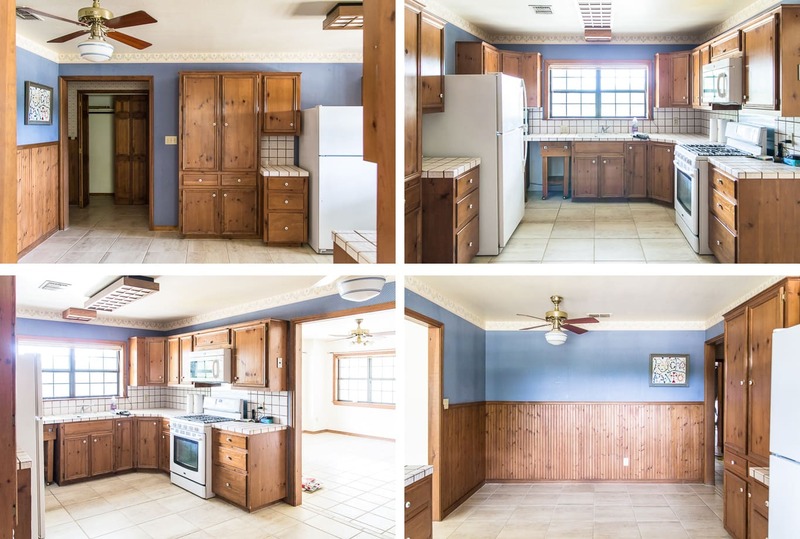 In all our previous remodels, we have managed to stay within a tight budget by keeping as many appliances as possible from before the remodel… but this kitchen was ready for a full makeover. 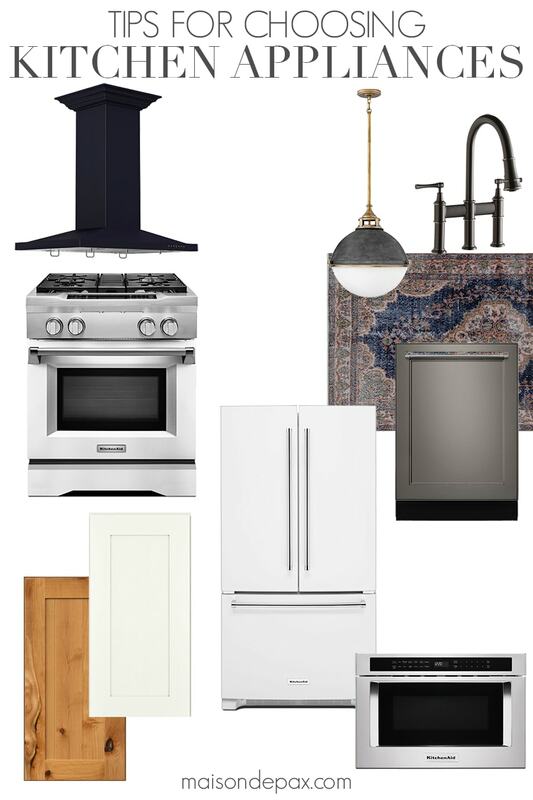 And I’m so excited to be partnering with The Home Depot to choose the perfect appliances for this rustic modern kitchen. To see more about our design plans, you can see my initial mood board here and our cabinet choices here. In addition to a style upgrade, the new floor plan of the kitchen dictated the need for some different appliances. 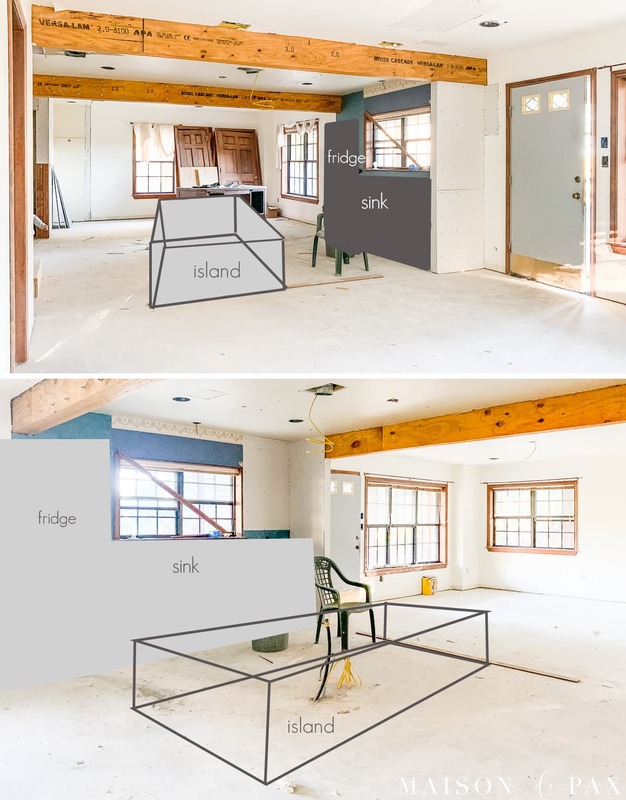 We have removed two of the three kitchen walls and are adding a giant island, opening up the kitchen to the living room on one side and dining room on the other. That has, consequently, left us with only one working wall with just about 10′ of usable space. Since the sink needs to remain centered there under the window, our other options were limited. The only wall had to contain the fridge, and since it already had the sink (and dishwasher), everything else had to go in the island. The fridge and dishwasher ought to blend in rather than stand out (since the space is completely open to the living/dining). I didn’t want huge stainless appliances being the central focus of the entire house. We needed to preserve as much clear counter space as possible (since the island counters are great for working but not for storing anything). So without further ado, here is what we’ve chosen (and why)! We have a KitchenAid fridge in our current kitchen (which was left by the previous homeowners), and we’ve loved it, so it seemed a natural place to begin. If you remember, part of our design goals were to create a space brimming with charm, and while I love stainless appliances in a fancy modern kitchen, they didn’t feel like the right focal point for the entire living space of our country/ranch house. 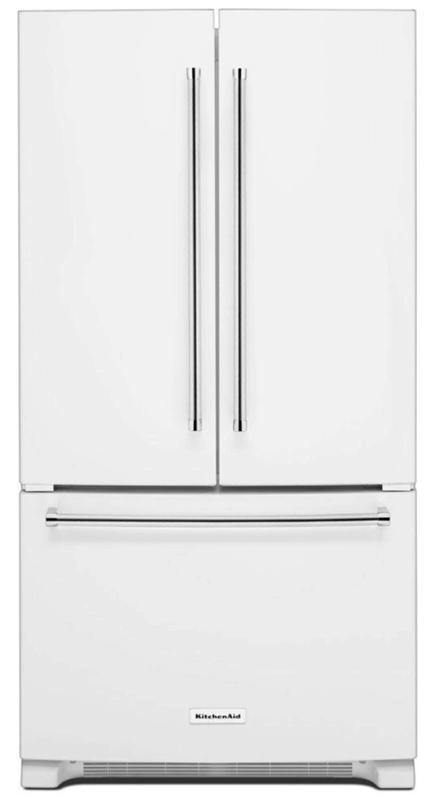 So when I found this white fridge by KitchenAid, I was smitten. Because of the location of the fridge in relation to the rest of the room, I knew I wanted a counter-depth unit (though there are some larger, deeper white options available, too). I was very tempted by the white dishwasher that matches the fridge we chose (and I’m sure it would have been a good option, as well! 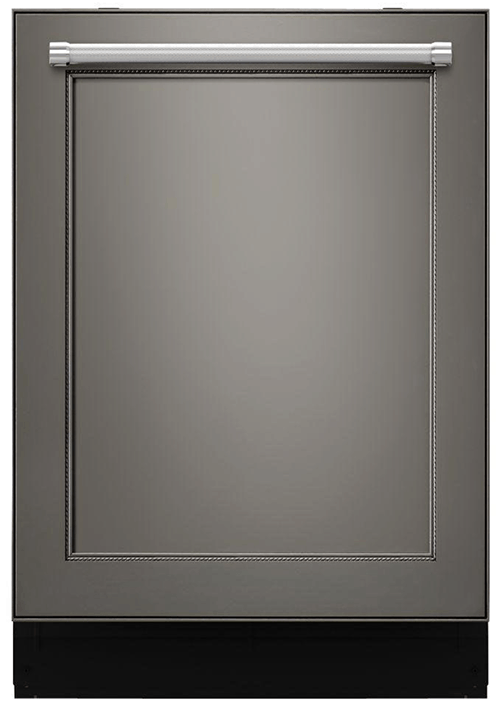 ), but when I found this panel-ready dishwasher I thought that would help even more with our desire for the kitchen to feel like a charming living area. I love that it will simply blend in with the cabinetry we’ve chosen. While I’m so excited about the very open design of the kitchen, part of the challenge is the very limited wall space. We will only have a couple of feet on either side of the sink before we hit the fridge on one side and the solo upper cabinet on the other (which we did precisely to balance the fridge)… With our range in the island (and our pantry too far away to make that a feasible choice), a microwave drawer in the island was really our only good option. And I’ve never had one before!! So I spent lots of time scouring reviews, etc. and finally decided that going with a brand I already trusted seemed like a good option. And while the microwave drawer we chose is stainless (I haven’t found any white ones yet 😉 ), it will be in the island facing the sink rather than facing the living spaces, so I think it will be great. Since we had deliberately chosen not to go the stainless route, finding an island hood was a tricky endeavor. We considered a downdraft, but they’re not really recommended for high-powered ranges like the one we had chosen, and installation can be tricky for cabinets and countertops… so we decided to stick with an island hood. Then I created about a million mock ups of different colors, styles, sizes, etc. 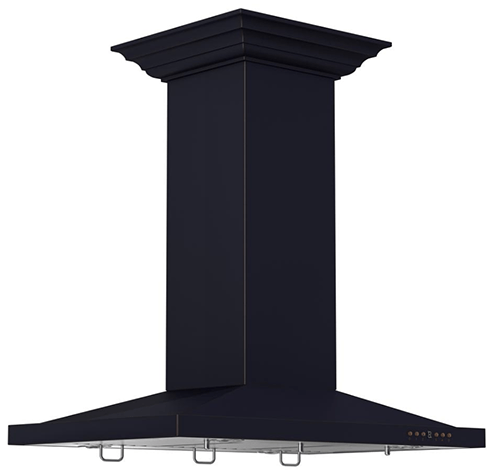 and finally decided that a simple, black range hood would compliment the windows throughout (which are dark) and thus be enough of a contrast to stand out but simple enough to blend in. And since this baby was a third of the price of the custom one I had quoted before I found this one, it seemed like a definite win. 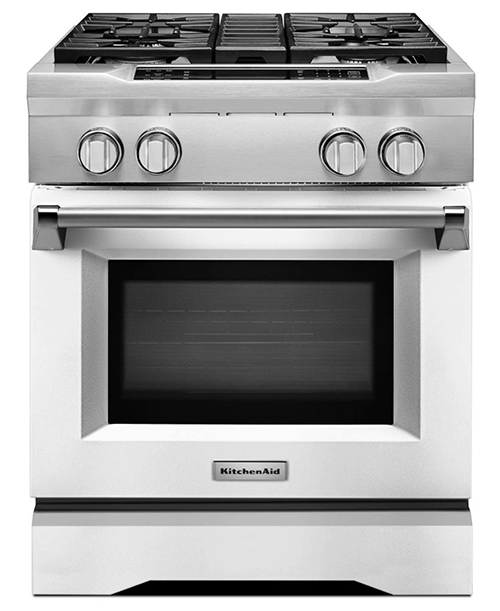 In my recent post on how to start designing a kitchen, I mentioned that appliances are basically the first step. So in order to help you in your next kitchen remodel, I thought it might be useful to summarize the factors we consider (pretty much in order) when choosing our appliances. I think streamlining often helps when trying to recreate a process in a new space. As I mentioned, in all our previous kitchen renovations, budget was a #1 priority. As such, we kept the ones that were still functioning (and not complete eyesores 😉 ), and we upgraded only those that new layout required. After deciding the actual space/location for the appliances, we weighed our options that would give us the best use of our counter space. Then, with exact dimensions and types in mind, we began identifying the ones that would work with our design style. Once we had that set, we narrowed down based on reviews and chose ultimately based on the features we wanted most. I must say that doing all this online (where you can click and narrow down by size, color, features, etc. and then read reviews right on the page) made the process so very easy! And we can’t wait to enjoy these appliances in our new space. And be sure to pin this for later! I made the mistake with my last house of choosing white appliances. I wanted an all white look, but there are all kinds of white. My new appliances made my cabinets look dingy. I regretted replacing the stainless. In this house, I choose black appliances, and the white cabinets really stand out. That’s a great point, Dottie! Whites can be so hard to match up. make sure you get the “white white”. it’s a different color of itself and much brighter. also, you forgot to mention service and warranty on your appliance choices. in the past, we’ve chosen some very high end appliances but the service and parts availability were so difficult to find, that I’m down to making “service and repair” priority number one. can’t wait to see your kitchen makeover when it’s finished. I like your thought processes and I love that big island! Debbie, such good tips. Thanks for sharing! I’m excited to reveal everything to you too! 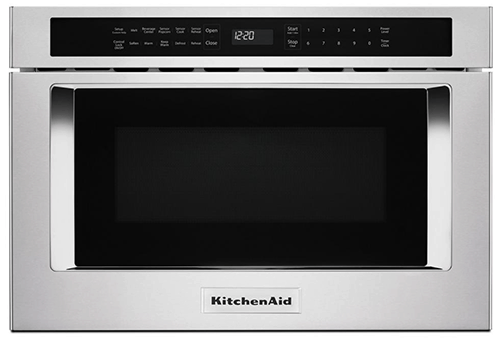 I just bought a KitchenAid fridge I am loving! I chose white over stainless as I do not want to feel like I am at work when I am at home. I want to relax! White is such a great option too! Thanks for your thoughts, Kris! We have a Kitchen Aid counter depth in stainless steel and we love it. We purchased ours about 18 months ago and couldn’t be happier with our choice. The white one you have chosen is really nice. Thank you, Pat! We use it a lot! I do agree that I have to consider my budget before I buy any kitchen products for my new kitchen. If it’s possible, I’d like to buy a Frigidaire product since it has good ratings. It might also have the features I’m looking for but I’ll see what other brands have in store for me. 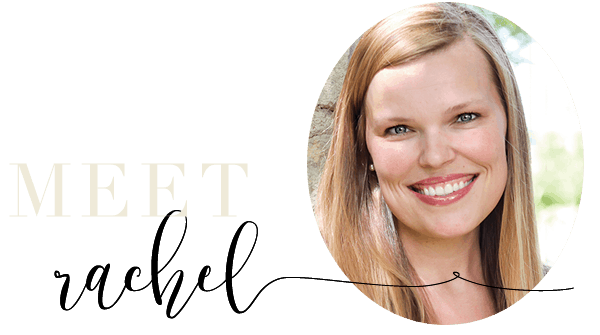 It definitely requires some research, but I’m confident you will find the right fit for you!